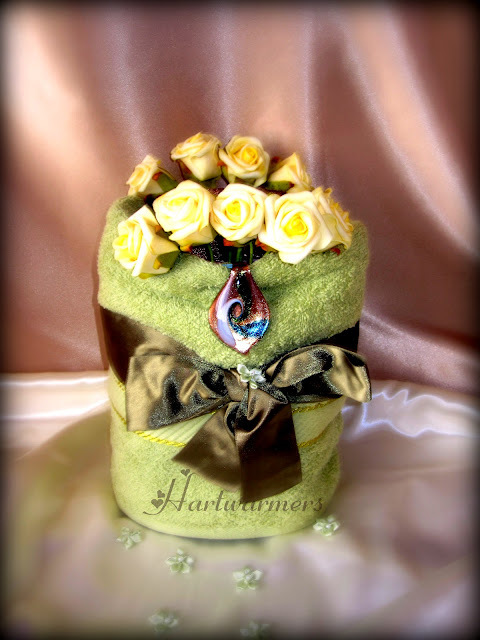 This Pearl Gift design was such a big hit, that I was requested to make yet another. This one is called Serenity Pearls. This is a beautiful piece that I had just finished. A dear colleague of mine, will be due next month, with a bouncing baby girl. She is such a wonderful lady, that I felt I needed to do something special for her. And Whalah! this beautiful diaper cake. 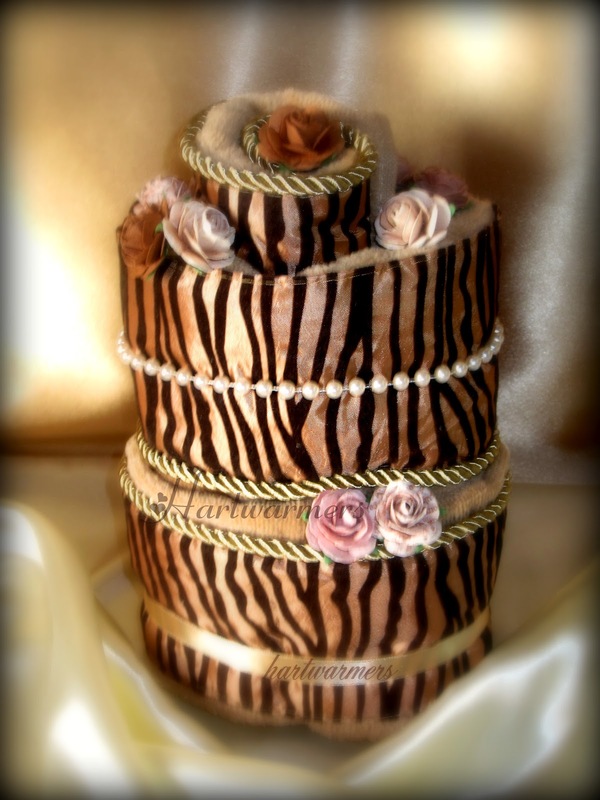 This piece comes under the DIAPER CAKE SINGLE TIER SERIES. 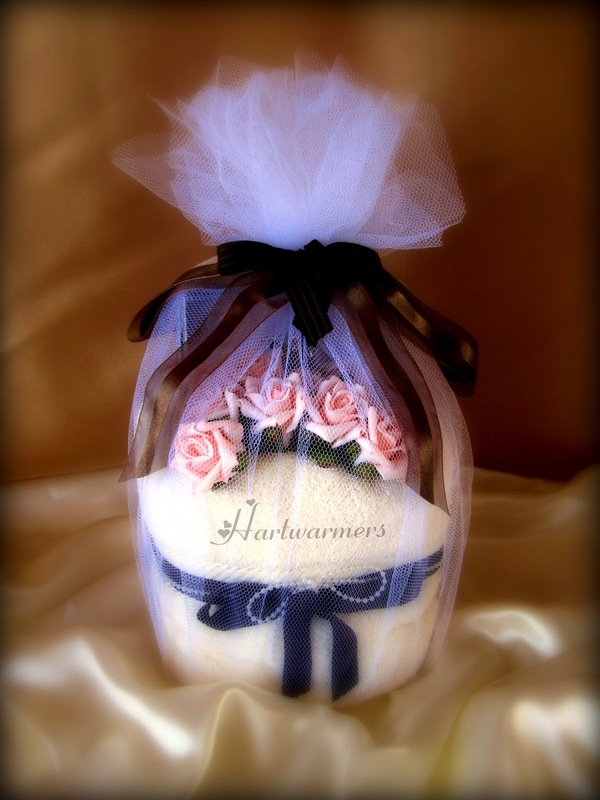 Here at Hartwarmers, all diaper cakes are carefully placed together, with as much tender loving care as possible, to ensure hygiene and durability, of products. 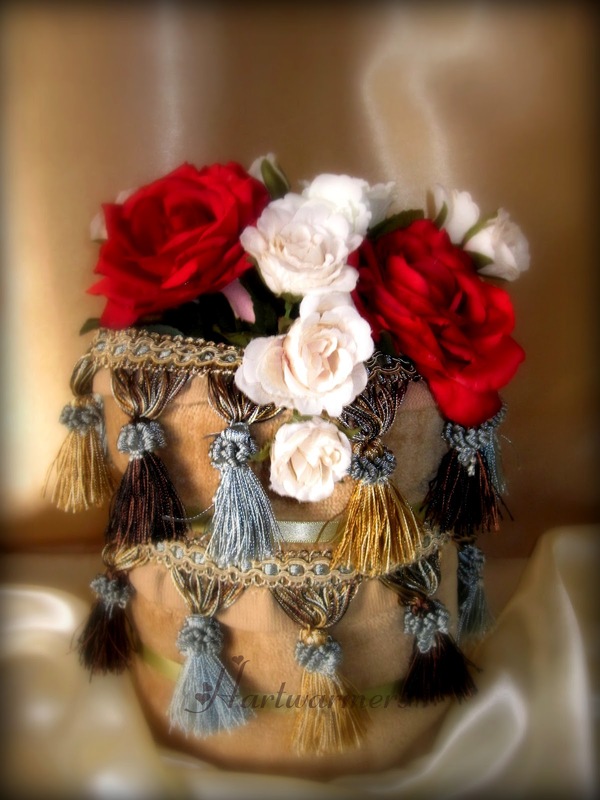 They are further adorned and decorated with pins and designed ribbons. Finally, the gifts are ready to be delivered after they are wrapped in an elegant tulle. 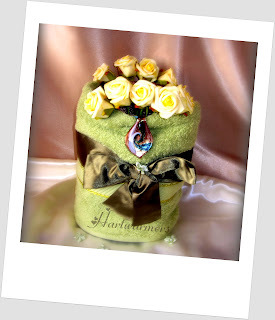 How then could your gifts, not be a heart warmer? 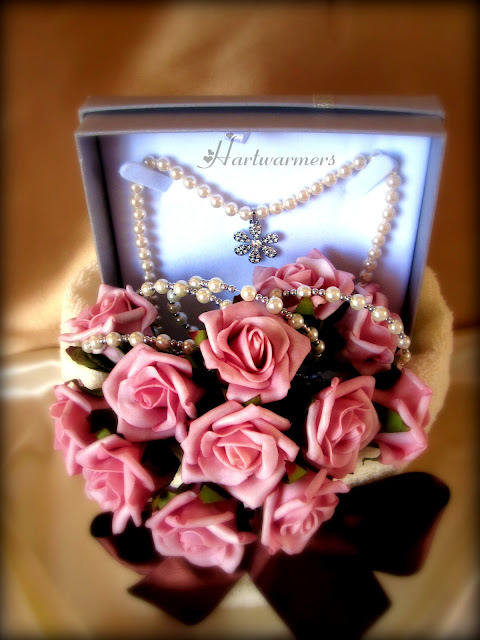 Along comes Mother's Day again, and this time, I took a more elegant approach with Pearls from Chomel. This was my first piece I had tried out with pearls and it sold very well. I had just completed this and had uploaded it onto my Facebook. But even before I could upload it onto my blog, it was already bought. I was so excited. 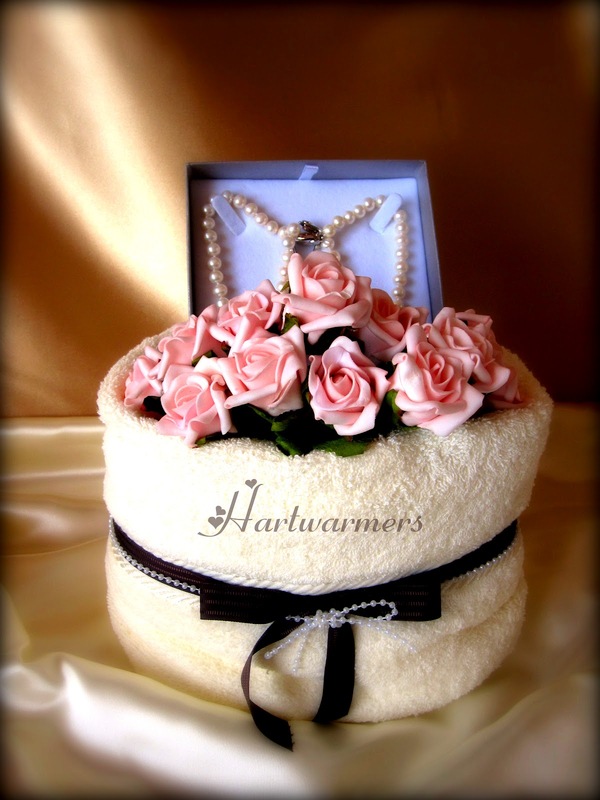 This is an elegant piece that is from the TOWEL CAKES SERIES. 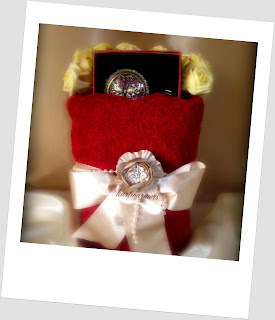 My dear client, loved the gift so much that she requested another similar one. However, as mentioned before it's difficult to have two gifts that are identical. This second piece was made almost similar, except for a couple of changes. All towel cakes are placed together, with as much tender loving care as possible, to ensure hygiene and durability, of products. They are further adorned and decorated with pins and designed satin ribbons. 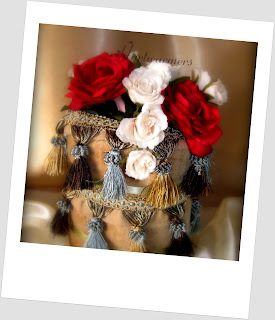 Finally, they are set to go after being wrapped with elegant tulle. How then could your gifts not be a heart warmer? Should you be interested in getting your hands onto one of these elegant, classy pieces, do contact me or drop me an email. Improvising from the existing TOWEL CAKE SERIES, is a couple of new additions. Starting off with the unique shaped towel cake for the people who are not afraid of change. 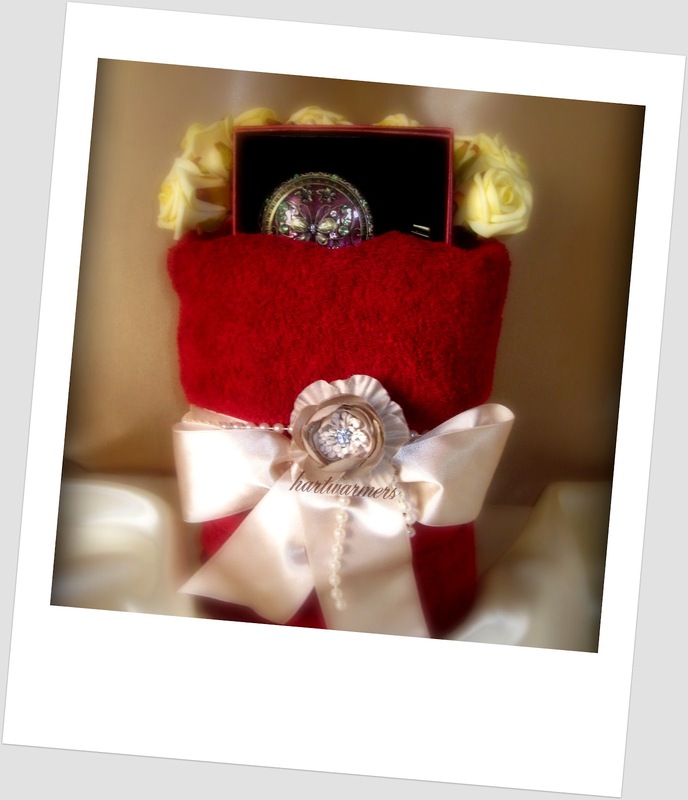 The TOWEL CAKES SERIES can range from S$40.00 onwards. Should you be interested in creating your own unique towel cake, kindly do contact me or drop me an email. 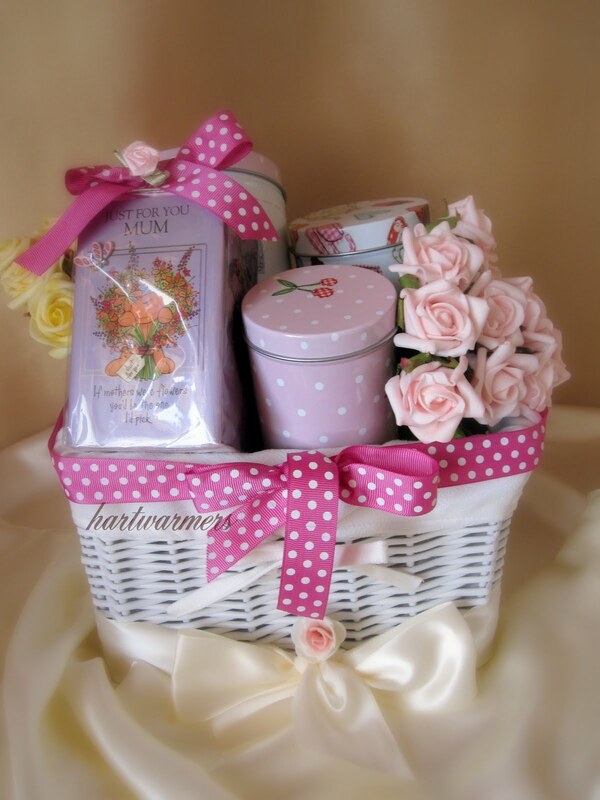 This is definitely for anyone who is passionate about pink, the candle can be changed to suit the person you are presenting it too. In this case, it was used for a mum. 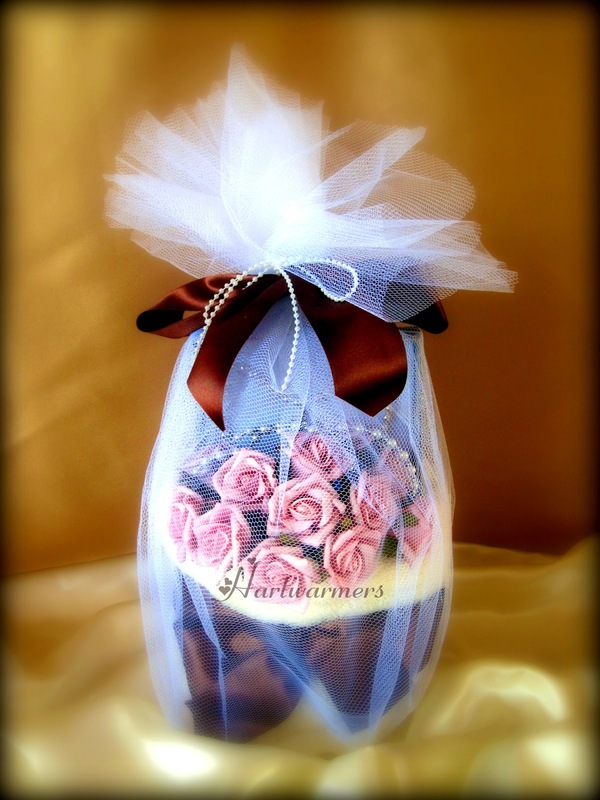 You may request for that special person, and I will definitely make the attempt to get it for you. However, due to stock and availability, it may vary. I am a person who adores Shortcake (my favourite). 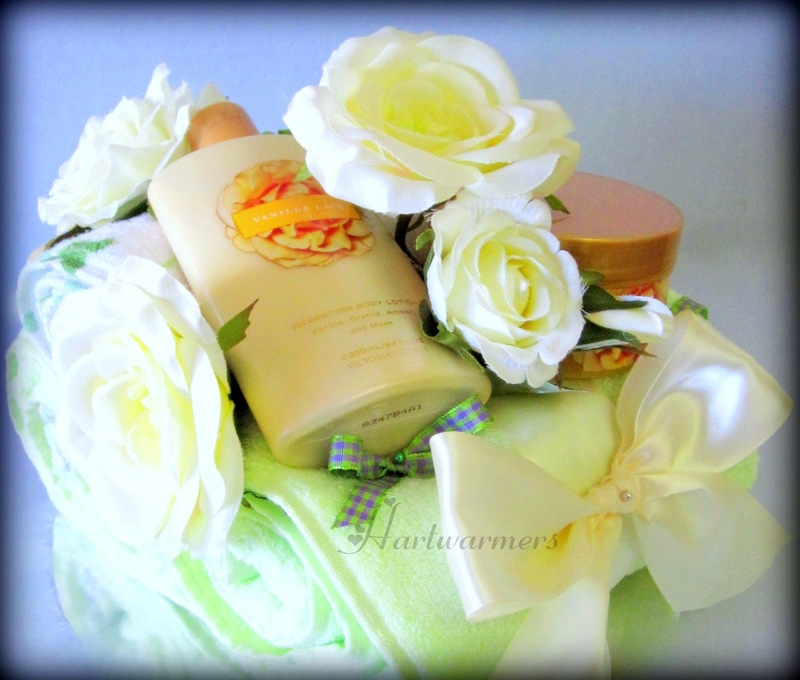 I thought that it would make a great addition to this basket. Adding come of these, added lots more comfort (and calories) to the gift instantly. The Pistachio Biscuits, were however, a healthier choice, I would say. But they tastes, just as yummy, and goes great with afternoon tea. You can practically, add anything that you would like to the basket. 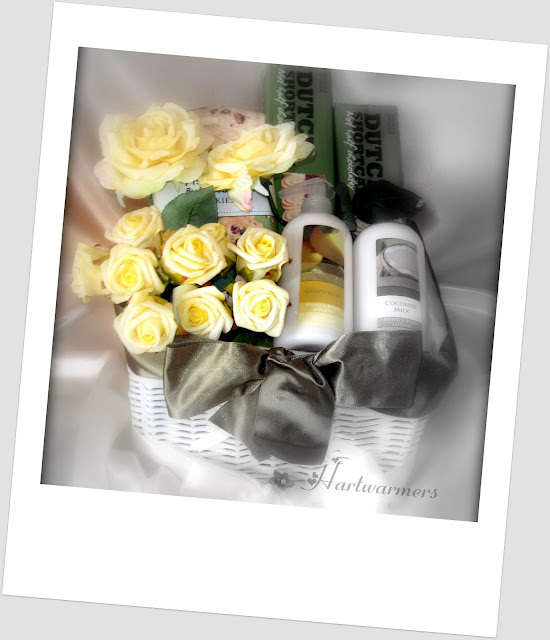 You would definitely know the person you are gifting, much better. 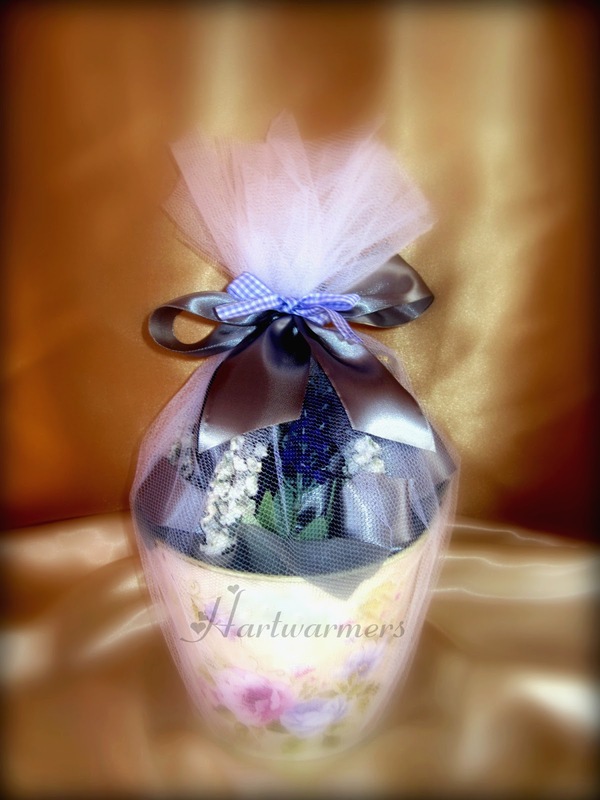 This is simply an elegant gift that will warm anyone's heart. It has a touch of elegance, sweet smelling scents and vintage pieces all wonderfully packaged. 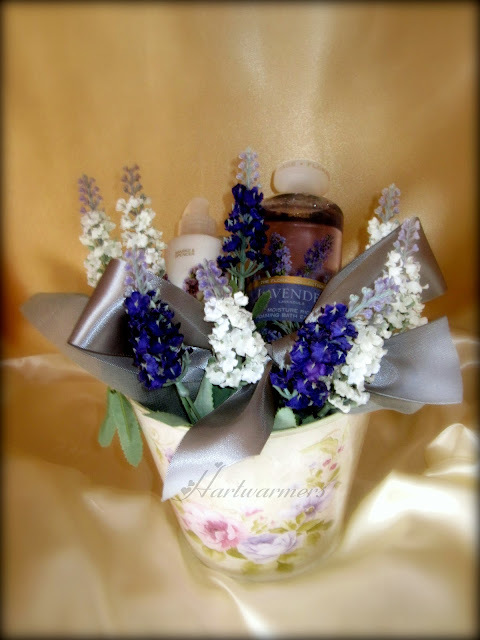 I have been noticing a trend where Lavender scented stuff have becoming a big hit amongst my clientele. 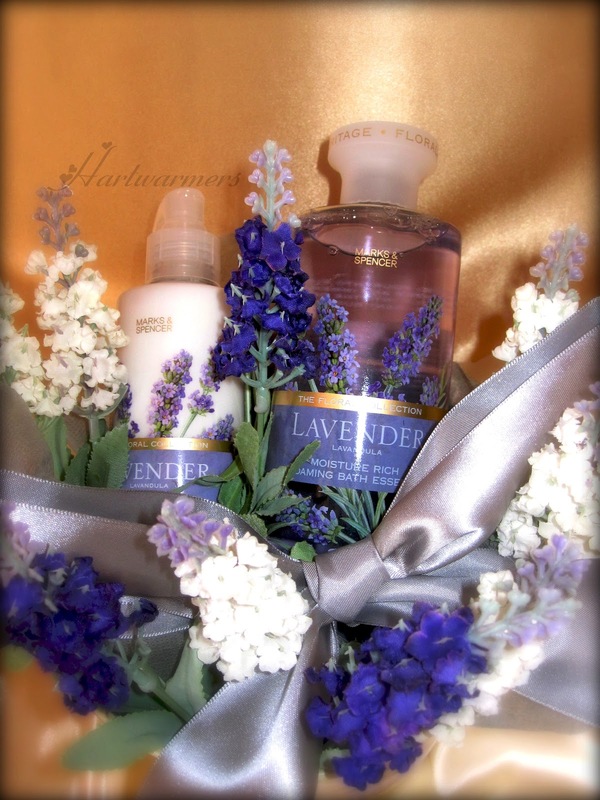 When you think of Lavender scents, you think fresh, calming and relaxing feelings. And I guess, you are telling the one you love, that you want them to take some time by themselves to rest and relax. 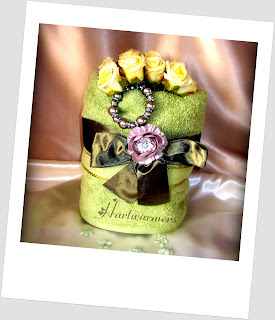 This simple piece went for just S$50.00, to a regular customer. I love having tea and catching up with friends. A cup of Earl Grey always relaxes me. 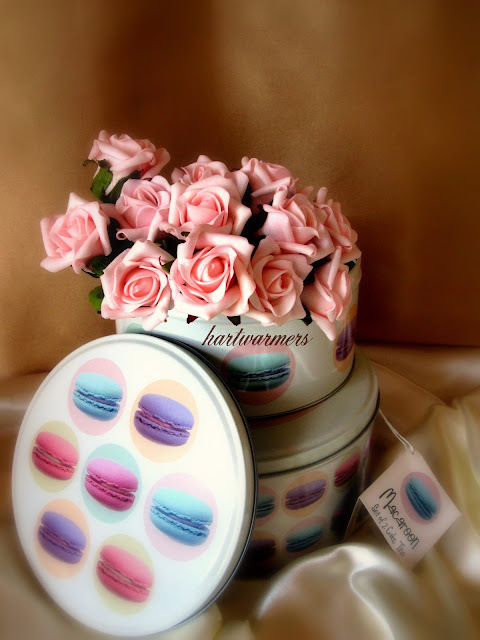 To accompany The Earl, is anything sweet for me. 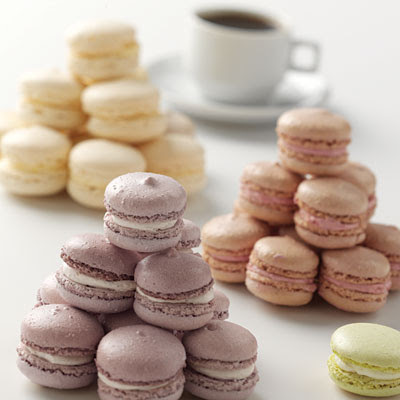 Macaroons are inviting anytime, but even so, when its tea with friends. If you know someone who has a sweet tooth, this next gift idea is great. 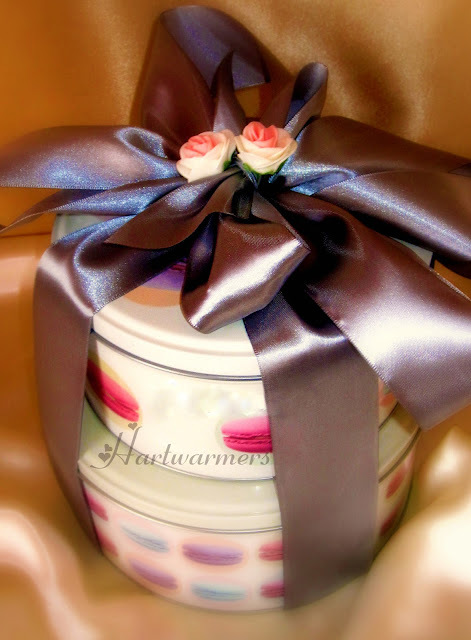 If you order the adorable tins they only cost you, S$39.90, with the flowers and tulle wrap. However, should you need me to fill the packaging with Macaroons, kindly give me ample notice, and please note the price will vary accordingly.